7 days 9 hours 47 min 51 sec remaining in the April competition. 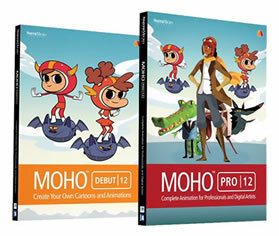 If you're looking for software that is easy to use and fun to animate with, Moho Debut is exactly what you're looking for. 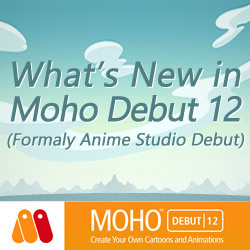 Moho is the new name for the new version of Anime Studio. New features in Moho 12 Debut include a new user interface with a new colour scheme, new icons and colour adjustment options. The new library has multiple folders and easier search. The new Layers Panel makes viewing layers easier. Import and export vector graphics in SVG format. The new Auto Freeze Keys option helps you create key frames for every adjustment and bone. Pin Bones are a new and fun way to animate to bend, shape and resize. Bone improvements include new bone colours.